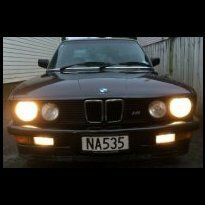 So I have an E30 325i that I've been driving off and on over the last three years, but only recently has it been my only daily driver, and as such fuel economy is important, and it has gotten pretty bad. I'm talking 13-14L/100km. I drive sedately, with the odd blat up to 100kmh, and this is mixed from city and highway driving. The car doesn't seem to have any real mechanical issues. It always starts fine when cold, although it is slightly rough until it warms up. However, when hot, one out of every ten starts will require a few more cranks until it finally catches. Other than that, it drives fine with good power. Does anybody have any idea why it is running rich? I took the sparkplugs out and put some new ones in, and the old ones definitely show some evidence of rich running. blue plug on top of thermostat housing. sounds about right for an ocassional spirited drive and city driving. my 316i does 7 or so when i dont fang it, rises to around 11-2 when i do over the whole tank. the 320i/5 (first car i had) got about the same as what you are saying. but to improve, start with what brett says. clearing historic error codes and/or adaptions may help in its own right. When was the last time injectors were cleaned? My cold idle got smoother (because my engine was missing slightly) and fuel economy went from around ~11.5L/100km to ~10.5L/100km (on a m401b6) after professional cleaning. Also, what fuel do you use (91, 95, 98)? etc..
Andy, what do you mean by error codes clearing etc? I saw you mention it before, does it reset meter reading of something? when the ecu detect a fault or miss reading from a sensor it stores a code and reverts back to a basic fuel map which usually uses more fuel. clearing these codes, or much much better reading them and replacing what it reported as bad, will put it back into its normal running mode and use less fuel. I refuse to believe that it can use that much just in gentle driving, and I don't give it much of a spirited thrash. I used to get down to 9L in it when I first got it! This economy is with a long trip as well. As for injectors - I don't think they've ever been cleaned, and the car has done 230,000km. I was meant to get some injector cleaner today but I forgot. How much did it cost you to get them cleaned? I've used 91 and 95, and the difference between them was minimal. It seems to run the same on 91 and 95. How do I go about finding out if I have any 'historic error codes'? How do I know if the temperature sender is faulty? Or has bad connections? How do I know if the AFM is faulty? And lastly, how do I check if the dizzy and rotor are worn? I'll give it a search here and the web in the meantime. Thanks all, I'm a bit of a noob with some things. Of very little help to you but mine does anywhere between 12-15L / 100km of mainly round town driving. injectors costed me ~$40 cleaned each, with new Pintle Caps, o-rings, filter baskets and adjustments to make it spray in similar volumes and in good pattern. yep 100% right. on later versions i believe it could advance vanos timing to suit the driver etc too but that stuff is irrelevant for this discussion. regarding the M40 engine, i thought the same as you but i wiped the codes and adaptions on my M40 and all of a sudden the engine ran a lot better which is strange. the car is currently on empty now after a full tank so im looking forward to seeing what difference it made. the M20 should be the same, as its a very similar ECU system if not the same. injector cleaner is a waste of time. get them ultrasonically cleaned, buy new, or dont bother. you shouldnt see any difference between 91 and 95, the only improvement will be due to your wallet being lighter. the M20 isnt technically advanced enough to make use of the higher octane. you'd need to get a buddy/BMW mech/dealership to scan it. Not quite. Depends on which M20, as I know PFL m20b20s had high compression ratios, and while i haven't tried it, I'm lead to believe you could easily get a bit of pinging running on 95. Although on the topic of his b25, I have no idea what CR they run. Also, higher octanes allow you to run more aggressive ignition timing, which CAN improve fuel economy. (Provided it is tuned correctly). My PFL 325i E30 is a hell of a lot worse and usually does around 18l/100kms. Doesn't quite get up to half way on the temp gauge so im going to chuck in a new thermostat but i keep putting it off. His driving is mostly shortish trips, either around the suburb, or 80 zone for 8kms to town, or hilly winding 8kms to my place and whatever mixture in between. A few longer drives here and there, but basically easy driving. I think auto E30's are quite a lot hungrier too. So my average has gone down to 11.3L/100km, which is a bit better I guess. That is with the mix of a long trip and around town, with the odd blat of course. I've ordered a new thermostat, and in the process of getting new temperature sensors for both the gauge and the ECU, to see if it will get the needle towards the middle. I get 400-450k max from a tank which is a 50/50 mixture of town and country, I'll be interested how your replacing sensors on the gauge and the ECU works out. With a 2 litre M20 powered E 30 with manual trans and a mixture of local and motorway driving,its returning 10 l/100km.Temp gauge runs in the middle. Can the thermostat housings cause problems like this when they get old/corrode? Nope but I tested it before I put it in and it seemed ok. Might not be a good fit so will be putting the genuine one back in and inspecting the housing while im at it. My touring used to do 8.5~9L/100km on the daily commute <70kph. Facelift M20B25, manual, 3.64 diff. Old race car did around the same thrashing it on the way to Taupo, PFL M20B25 (330,000kms), manual, 3.73 diff, stripped. Current 'iS happily does 7L/100km blatting it everywhere, probably 8L/100km if you take into account speedo error. All run on 98. Perhaps that's the difference? Mine are both 80degree ones. Can you actually get hotter thermostats? Genuine is 92, try that before you do anything else.